KEM MORTAR HS is a single component cement based enriched with fine additives, fibre reinforced restoration mortar. 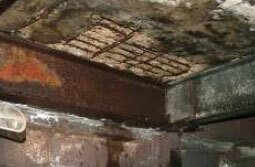 Used for structural repair new and old concrete. Applied manually or mechanically. Concrete repair affected by repeated loads. Structures affected by marine environment. Bridges, harbors, dams. 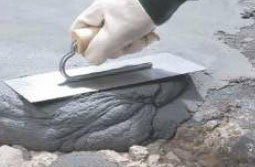 Repair of prefabricated concrete elements. 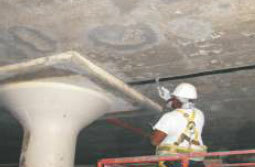 Repair of concrete structures with carbonation process. Repair of damaged areas in industries due to aggressive environment. Coverage of KEM Mortar HS is 2 approximately 1.85 Kg/m / mm thickness with yield of 13. 75 litres. KEM MORTAR EP 1 is thixotropic solvent free, two component epoxy based repair mortar. The base component is white coloured and the hardener is grey to facilitate ease of mixing. For filling blow holes, making fair slightly damaged concrete, eliminating minor irregularities prior to painting or coating. Highly recommended for repair of structures that will be permanently submerged in water, sea water like water intake areas in power plants etc. As an adhesive for bonding pre – fabricated concrete bridge segments. 2, 4, 8 kg pack covers 0.7mm to 1mm thickness per kg at application thickness between 0.5mm to 4mm. KEM MORTAR EP 2 is solvent free three component epoxy based repair mortar it can be applied at a thickness between 5mm to 50mm in horizontal & 5mm to 10mm in vertical. For speedy and permanent repairs to concrete structures, where strength, impermeability to water and resistance to aggressive chemicals is essential. Emergency repairs to concrete structures, repairs to acid tanks, sea walls, industrial floors in plating shops, chemical handling and process areas and bedding of precast concrete beams. It is suitable for use in marine environments. yields 8 litres giving a theoretical coverage of 1.6 m² at 5mm thickness. KEM MORTAR EP 3 is a three component solvent free epoxy based mortar, designed for fast and durable repairs to concrete, particularly in vertical or overhead situations. It can be applied at a thickness between 5mm to 30mm in vertical, and 5mm to 25mm in overhead in one layer. For speedy and permanent repairs to concrete structures, especially in overhead and vertical situations where "High Build" repairs are required and impermeability to water and resistance to aggressive chemicals is essential. For emergency repairs to concrete columns, lintels and roof-beam faces, to provide a dense impermeable finish and protect the embedded reinforcing steel. 10.5 kg packs which yields 10 litres giving a theoretical coverage of 2 2.0 m at 5mm thickness. KEM Mortar MT is supplied as a ready to use dry powder requiring only the addition of water to produce cohesive easily applied mortar. The product is a careful blend of portland cements, graded silica sands, shrinkage compensating agents, silica fume, water reducing agents and compatible water resistant polymers. The product is designed to give good adhesion and cohesion in the plastic state and low water requirement resulting in a non-shrink low porosity mortar with good compressive strength and durability. KEM Mortar MT is recommended for structural repair of damaged concrete for beams and columns in inland and marine environments, and as a general purpose repair mortar for concrete floors and highly trafficked areas. It is highly recommended for vertical as well as overhead applications. It is suitable for structures in highly humid atmosphere such as marine and offshore installations. KEM MORTAR FS a rapid setting mortar made from special cements, fine aggregates, additives and fibers. It requires addition of potable water for mixing. It produces high early strength and achieves initial set in 10 to 30 minutes. Final set is achieved in 30 - 90 minutes. 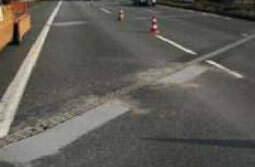 Repaired areas may be opened to traffic within 2 - 4 hours, after application. KEM MORTAR FS is for quick repairs of horizontal concrete surfaces such as airport runways, expressways, highways, bridge decks, sidewalks, parking decks, loading docks and floors. It may be used in vertical application with proper form work and care. 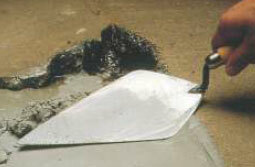 A 25 kg bag after mixing with 11% of water will produce 12.4% liters of mortar. If aggregates are added then volume increases accordingly. KEM BRICKLINE 10 jointing compound is a bricklaying mortar made from a special combination of cement, graded sand and additives. It is generally applied at a thickness of 3mm, being a pre- mixed mortar it is easy to use & always consistent in performance. KEM BRICKLINE 10 jointing mortar is a versatile thin jointing material for laying AAC blocks, fly ash bricks, concrete blocks etc. 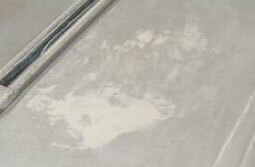 It replaces conventional sand & cement based mortar. 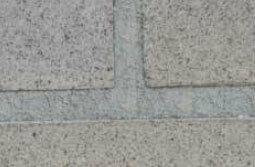 It provides a thin but much more durable bond between blocks than the conventional mortar. KEM BRICKLINE 10 covers 2.75 to 3.25 sq. mtrs in normal condition with average thickness of 3 mm for a bag of 25 kg for blocks size 600 X 200 X 150mm. The coverage area however will depend upon the quality & evenness of the substrate, thickness of joints and size of masonry units.